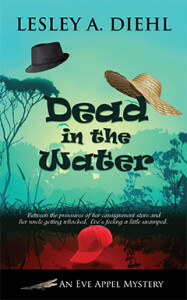 In Dead in the Water ($13.95, 246 pages, ISBN: 978-1-60381-937-4), a new cozy mystery by Lesley A. Diehl, consignment shop owner Eve Appel vows to find the killer of her wise-guy uncle after he is shot in the head on a sightseeing trip. Dead in the Water is the second Eve Appel Mystery, set in rural Florida. The series began with A Secondhand Murder. Lesley has five other published mysteries: A Deadly Draught, Poisoned Pairings, Dumpster Dying, Angel Sleuth, and Grilled, Chilled, and Killed. “A well crafted cozy mystery that has action, adventure and detective work involved through a few interesting and fun characters to read about. While reading the book I got intrigued enough by Eve and her list of quirky friends that I’d like to read more books in the series. Especially about Eve’s Indian friend.” Read more…. “There is action galore. The plot becomes more convoluted as new developments take place just as answers seem evident. Each twist is followed by a further twist, the action is continuous, and Eve is suitably confused…. RECOMMENDED.” Read more …. “They say that you can choose your friends but not your family. This saying is taken to the extreme within the pages of this book. First there is Eve Winston’s real relative. Then there are the Russian stepchildren related by marriage. And finally there is the ‘mob.’ Someone wanted Winston dead. We know it wasn’t Eve. And if Eve doesn’t figure this all out soon she might wind up like her uncle. Dead in the Water is a wonderful thriller…. Ms. Diehl has provided us with a great character in Eve Appel.” Read more…. —Patricia Gligor, author of Mixed Messages, Unfinished Business, and Desperate Deeds. Sabal Bay consignment shop owner Eve Appel is fit to be tied—family tied. Just as she is basking in the warmth of a renewed relationship with her long-lost Uncle Winston, disaster strikes. He and his less welcome companion, Darlene, have come for a visit, and their request to participate in one of rural Florida’s most popular tourist activities, an airboat ride through the swamps, ends with her uncle being shot in the head. The killing looks suspiciously like a mob hit. Turns out Uncle Winston was “connected.” Was he simply a bag man, or something more? Who is Darlene, really, and how did Winston acquire three Russian stepchildren, one of whom has been kidnapped by yet another mob family—this one Russian? Winston claimed to prize family above all else, but what “family” was he talking about: his niece Eve, his relations by marriage, or his mobster employers? When Eve’s best friend Madeleine is kidnapped, Eve doesn’t know where to turn. Her mob-boss buddy Nappi Napolitani? Her new Miccosukee Indian friend, the long, lean, and luscious Sammy Egret? Her ex-husband, Jerry, who is in Nappi’s employ? With two mob families on her tail and her boyfriend, PI Alex Montgomery, mostly away on assignment, Eve has to act fast. Before whoever wrecked her car and left her to the mercy of the alligators finishes the job they started. Lesley A. Diehl retired from her life as a professor of psychology and reclaimed her country roots by moving to a small cottage in the Butternut River Valley in upstate New York. In the winter she migrates to old Florida—cowboys, scrub palmetto, and open fields of grazing cattle, a place where spurs still jingle in the post office. Back north, she devotes her afternoons to writing and, when the sun sets, relaxing on the bank of her trout stream, sipping tea or a local microbrew. Click here to find Lesley online. “A ride on your boat. How much?” Why else would I be here? Not for the polite conversation. He uncrossed his arms and stepped forward. “It’s kind of late in the day. And it’s cold. You sure you wouldn’t want to come back another time?” He looked me up and down, then settled his gaze on my boots. His surly attitude swept my hesitation to one side. I was determined to have a trip on that boat today. His sweeping visual assessment of me made me feel as if my clothes hid nothing. “Well, we were both wrong then, I guess. That’ll be twenty bucks.” He held out his hand for the money. I extracted the bill from my jeans pocket. When he took it, he held onto my hand just a moment too long. The touch was electric. When he let go, I felt as if my hand had been branded. The heat of his touch remained. He gestured to follow him to the boat. I walked behind him, marveling at his height. He had to be at least six feet six. I’d never seen a native this tall. Most were shorter, rounder. As if he could read my thoughts, he turned and stopped. “My mother was white. Tall like you, but she had more up top.” He then continued down the path. He stopped and walked back toward me. “You want to go someplace in particular.” It was a statement, not a question. If the first airboat was like being on a carnival ride, this smaller boat slipped and slid over the surface of the water like a toboggan on ice. I hung onto the side of the boat as if expecting to be thrown into the water at any moment. Just when I told myself I had adjusted to the swaying motion and could move with it, the boat made a sudden jerk to the left. I gripped the side with both hands. I could almost feel the pilot smirking at my fear.